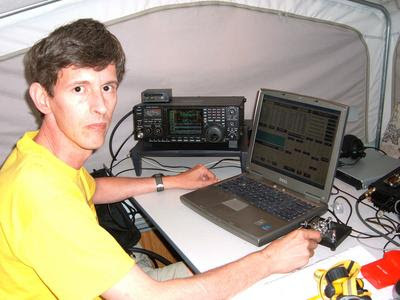 Every year I look forward to using my HF Ham Radio Station during the World Wide CQ Contest. CQ WW is where World Wide participation makes it possible to work new DX locations and rare activations brought to life by enthusiastic radio amateurs from all nations spread around the globe. The Contest lasts all weekend, 48 hours in total. I really enjoyed giving a few points away during the Contest and it was nice hearing some of the regular Contest Station's as well as the new ones of course! One big Thank you to All Station's worked! I did manage to get some of the World Wide CQ Contest on video later on in the Contest. Watch the video to see for yourself, the splatter and pile ups at my QTH using my Yaesu FT-767GX, Home brewed Delta Loop, G5RV and Hustler Vertical. N2IC 25/10/2008 1351 21 50 59 4 U.S.A.
K5TR 25/10/2008 1432 21 50 59 4 U.S.A.
W9RE 26/10/2008 1604 21 50 59 4 U.S.A.
K8AZ 26/10/2008 1609 21 50 59 4 U.S.A.
K1LZ 25/10/2008 1031 14 50 59 5 U.S.A.
KY2ZM 25/10/2008 1043 14 50 59 5 U.S.A.
K1TTT 25/10/2008 1314 14 50 59 5 U.S.A.
K1KP 25/10/2008 1338 14 50 59 5 U.S.A.
N4T 25/10/2008 1414 21 50 59 5 U.S.A.
WE3C 25/10/2008 1416 21 50 59 5 U.S.A.
K3LR 25/10/2008 1422 21 50 59 5 U.S.A.
K1DG 25/10/2008 1607 14 50 59 5 U.S.A.
KC1XX 25/10/2008 1611 14 50 59 5 U.S.A.
W3LPL 25/10/2008 1628 14 50 59 5 U.S.A.
KQ2M 25/10/2008 1630 14 50 59 5 U.S.A.
K3CR 25/10/2008 1719 14 50 59 5 U.S.A.
K3NA 25/10/2008 1900 14 50 59 5 U.S.A.
K1IM 25/10/2008 1907 14 50 59 5 U.S.A.
N3RS 25/10/2008 1910 14 50 59 5 U.S.A.
K5ZD 25/10/2008 1926 14 50 59 5 U.S.A.
K1RX 25/10/2008 2038 7 50 59 5 U.S.A.
K1TTT 25/10/2008 2040 7 50 59 5 U.S.A.
N1SV 25/10/2008 2042 7 50 59 5 U.S.A.
W4RM 26/10/2008 1333 21 50 59 5 U.S.A.
WA3EKL 26/10/2008 1337 21 50 59 5 U.S.A.
AJ3G 26/10/2008 1349 21 50 59 5 U.S.A.
AA1K 26/10/2008 1353 21 50 59 5 U.S.A.
W2GB 26/10/2008 1620 14 50 59 5 U.S.A.
K3WW 26/10/2008 1630 14 50 59 5 U.S.A.
N2RM 26/10/2008 1848 14 50 59 5 U.S.A.
K1RX 26/10/2008 1850 14 50 59 5 U.S.A.
Gonna be giving Our ears a rest for the moment and catching some serious Z's. 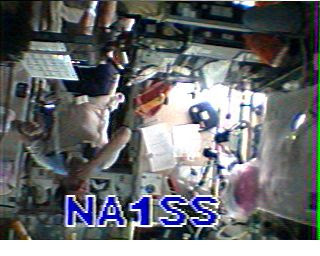 Today's SSTV transmission received from NA1SS at 10.11utc with a 5/9+40 signal at 2E0HTS Simon's QTH. I also heard Richard call out and I managed to get into the ISS and Richard came back, but it was very quick as half of Europe was calling at the same time. Hopefully I will get a better QSO next time. Thanks Richard and all at ARISS. This mornings SSTVs transmission whilst passing France and Spains border. 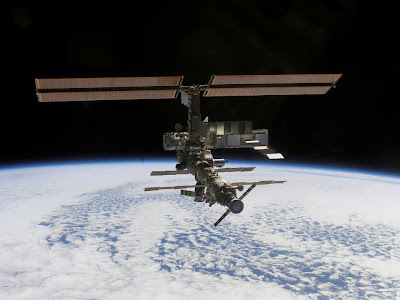 We have all been reading about the latest radio activity on board the ISS and many of us have been following the passes of the ISS, whilst waiting in anticipation to see if we can hear any interesting transmissions from the other side of the Ionosphere. 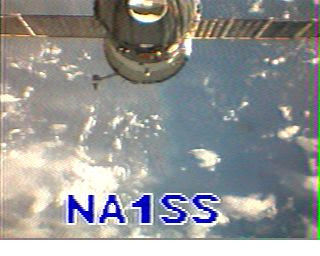 Today I got lucky and managed to not only receive a couple of Earth Shots from space, I also heard Richard Garriot (W5KWQ) working multiple contacts across Europe under the International Space Stations call sign, NA1SS. Satscape Screen shot of the position of the ISS as it moves away. 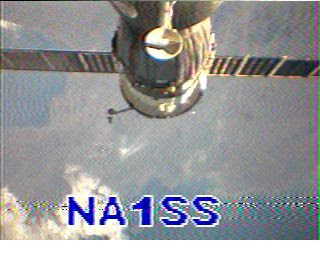 I used Yaesu the FT-847, the home brew IOIo beam, GS 250 rotator and MMSSTV to decode the images whilst tracking the ISS with Satscape. Incidentally I recently un-installed the Java version of Satscape and reverted to the previous version, as I found the Java version slowed down my connection speed an awful lot? My Computer is now running back at its normal speed (Broadband Connection) with the earlier Satscape program. I will be listening out for the ISS as well as the usual bands, have a nice weekend. The past few days have seen some good openings on HF for me especially on 20M, with QSOs being made from my Mobile Station as well as from inside the Shack. Shawn N3TEE from Newark in the USA and myself 2E0HTS, have been exchanging emails ever since Shawn commented on one of my videos. We have been trying to make QSO on 20 and 40M over the last couple of evenings and tonight using PSK31 we finaly made the QSO! Shawn N3TEE came through quite loud at times 57-599 running an Icom Rig but there was slight QSB. Nether the less, we managed a 10 min QSO and can now exchange QSL. Click to Enlarge, Shawn N3TEE's Lap Top p.c screen in RX with myself 2E0HTS coming through in The USA. Click to Enlarge,Simon 2E0HTS's Screen with Shawn N3TEE coming in loud and clear. I used my FT-767, Nomic Rigblaster, 3800Dual Core Computer,40-50 Watts through a Full wave Delta LOOP Vertically polarised. Thanks for the come back.. But not qso's only contacts. Here is my brag file. I'm running PSK31 Deluxe vX ou just townloaded it last night it seemyytod so far. I am starting to loose your signal I send you a screen capture of this qso. But we made the contact!! I am looseing your signal not very good cpy now. Thanks again Simon I get out your blog. Tnx to Shawn and everyone else I have been working using PSK31 Deluxe v4.0 and listen out for 2E0HTS in the very near future on the PSK bands. Latest Satellite confirmed QSL cards< As usual the radio's have been in use during the evenings after a days work and I have been working various Bands and Modes making some good QSOs. I also made a number of QSO's into the USA via Echolink. During one of the QSO's I tried to arrange a PSK sched with N3TEE-Shawn, but with one or two QSB issues we still have to make the QSO. Echolink can be a very useful tool for arranging radio contacts with DX Stations. I also received two nice QSL Cards sent direct to me confirming Satellite Contacts from AO-51 and VO-52. The Cards were from IK3VZS-Vinicio and EA3AGH-Jose, Thanks Guys my QSL cards have been posted and should be with you soon! With the propagation offering some reasonable evening openings and my Amateur satellite addiction still maintaining a good hold over my radio operations, I had to get back on HF and give my FT-767 a good airing off.h.i. So I have tried to do what us Men are not supposed to be able too do which is multi-tasking. I did this in the form of sending PSK on HF via the FT-767, and at the same time I tracked and worked a few Satellites . It worked out well with the one Microphone to work with in my hand, whilst using my Nomic Rig blaster in a semi automatic mode interfaced to my P.C. ( How many of us Hams have tried returning with an over holding the wrong microphone? h.i Me for one! Here is the Waterfall in full flow as I receive lots of big signals from around the Globe using WinPSKse. Here My most recent log entry's are showing various methods of making QSOs with some nice DX being worked at the same time. Thanks to all of you that have been emailing me telling me about your Satellite antenna's, Home brew projects and general radio news. Please continue to communicate with myself, all emails, information, advice and idea's are appreciated. CQ DX is anyone there? For more non-radio related poetry and articles visit Louise's Helium site here or maybe if you're lucky you'll catch her on air some day. Computers have been running many amateur radio programs since the birth of the P.C. I have always tried to keep reasonably up to date with most software and recently decided to give my Intel Dual Core 3800 some new hardware which was to be some more Ram memory and a HD Graphics adaptor. I compared the required hardware on the net where I got a good insight into the specifications available as well as the costs. Once I new what I wanted, I set off to my local shop and came away with both. 1 gig of ram memory(DDR) this was to compliment the existing memory, now doubling up to give 2 gigabytes of ram memory. 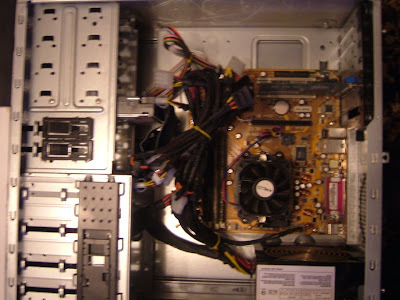 The graphics adaptor is a NVDIA 9600 GT 512 Megabytes HD card, I fitted it and with both items installed correctly the computer should give excellent performance. With the new hardware installed i decided to back up my logs/data and then I formatted the C: drive completely wiping it clean ready for a fresh install. The re-installation takes some time but is well worth it once all software/drivers are updated giving fast and reliable performance for a long time, whilst running all my favorite radio programs. Here the mother board is exposed displaying the dual core processor(3800), the creative sound card used for all radio software and the ram hidden under the harnesses. 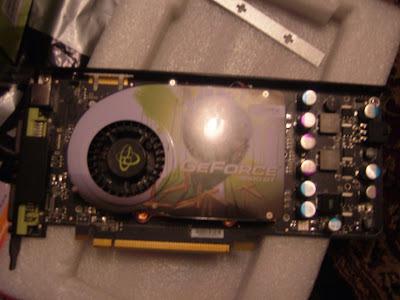 The NVIDIA GT 9600 512MB Card before the installation.